The Syrian civil war, also known as the Syrian uprising or Syrian crisis (Arabic: الأزمة السورية‎), is an ongoing armed conflict in Syria. It is a conflict between forces of the Ba'ath government and forces who want to remove this government. The conflict began on 15 March 2011, with demonstrations. These demonstrations were like demonstrations held in other Arab countries, which has been called the Arab Spring. Protesters in Syria demanded the resignation of President Bashar al-Assad. His family has held the presidency in Syria since 1971. Many of Assad's supporters are Shia while the majority of the government opposition is Sunni. In April 2011, the Syrian Army fired on demonstrators across the country. After months of military battles, the protests turned into an armed rebellion. Opposition forces were soldiers who had left the Syrian army and civilian volunteers. Opposition fighters had no central leadership. Battles took place in many towns and cities across the country. In late 2011 the Islamist group al-Nusra Front began to have a bigger role in the forces. In 2013 Hezbollah entered the war in support of the Syrian army. The Syrian government received military support from Russia and Iran. Qatar and Saudi Arabia gave weapons to the rebels. 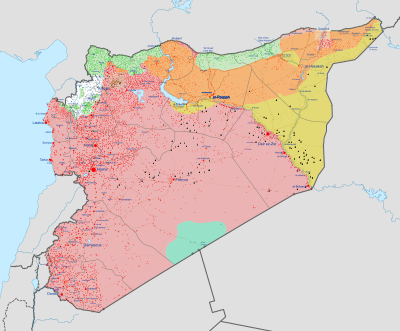 By July 2013, the Syrian government controlled approximately 30–40 percent of the country's territory and 60 percent of the Syrian population. A 2012 UN report said the battles were between different sects or groups. The battles were between Shia groups against Sunni rebel groups,. According to the United Nations, over 100,000 people were killed by June 2013. A total of 120,000 were killed by September 2013. In addition, tens of thousands of protesters were put in jail. There were reports that the Syrian government was torturing prisoners. International organizations accused both government and opposition forces of breaching human rights. The UN said most of the abuses were carried out by the Syrian government. More than 4 million Syrians were forced to relocate because of the battles and more than 2 million refugees left their country. Millions of citizens are still short of electricity, food and drinking water. In 2013 the Syrian regime used Chemical weapons against the rebels. This drew attention from the international community. The government reportedly surrendered their chemical weapons in 2014 but continued the war using other weapons. Later in 2014, the Islamic State of Iraq and the Levant became the most powerful opposing army, controlling more territory than the Syrian government itself. With all of this going on in Syria a lot of Syrians are forced to flee to other countries. ↑ "bomber targets Damascus shrine as 35 killed". 15 June 2012. ↑ "We've Never Seen Such Horror". Human Rights Watch. 2011-06-01. ↑ "Syrian defections hurt army morale". July 5, 2012. ↑ "Syria what you need to know". Retrieved 10 September 2013. ↑ "Al Nusrah Front claims 3 more suicide attacks in Daraa". 27 November 2012. ↑ "Hezbollah's elite leading the battle in Qusayr region of Syria". Ya Libnan. 2013-04-22. ↑ "In Turnabout, Syria Rebels Get Libyan Weapons". 2013-06-21. Retrieved 2013-06-25. ↑ Hubbard, Ben (17 July 2013). "Momentum Shifts in Syria, Bolstering Assad's Position". New York Times. Retrieved 10 August 2013. ↑ "UN says Syria conflict is 'overtly sectarian'". 2012-12-20. Retrieved 2013-09-09. ↑ "Nasrallah says Hezbollah will not bow to sectarian threats". NOW News. 14 June 2013. Retrieved 21 October 2013. ↑ Staff (22 December 2012). "Syria Opposition Contradicts U.N., Says Conflict not Sectarian". Naharnet. Retrieved 21 October 2013. ↑ "France urges action on Syria, says 120,000 dead". Alliance News. 25 September 2013. Retrieved 21 October 2013. ↑ Staff (May 24, 2012). "UN human rights probe panel reports continuing 'gross' violations in Syria". United Nations. Retrieved September 12, 2013. ↑ "UN must refer Syria war crimes to ICC: Amnesty". Agence France-Presse. 13 March 2013. Retrieved 21 October 2013. ↑ Laura Smith-Spark (16 March 2013). "Syrian general apparently defects, says morale among troops at a low". CNN. Retrieved 21 October 2013. ↑ "Syrian troops committed war crimes, says UN report". The Independent. 15 August 2012. ↑ Dagher, Sam (2013-10-02). "Syrian Regime Chokes Off Food to Town That Was Gassed - WSJ.com". Online.wsj.com. Retrieved 2013-11-08. This page was last changed on 27 February 2019, at 21:56.